Temple’s football season opens tonight. So: Why are they the Owls? Plus many, many more. The Temple football team opens its season tonight with a game against Army at the Linc. (Tickets here!) Temple’s team is known as the Owls for the most proudly prosaic of reasons: It started as a night school, with a student body that worked during the day and went to classes after the sun went down. (Temple’s live great horned owl mascot is Stella, who, when she’s not on the sidelines, lives at Norristown’s Elmwood Park Zoo.) Army’s team (technically now the Army West Point team) is known as the Black Knights, a designation that, rumor had it, would be dropped last year under a rebranding with Nike. They originally became known as the Black Knights because their uniforms were black. 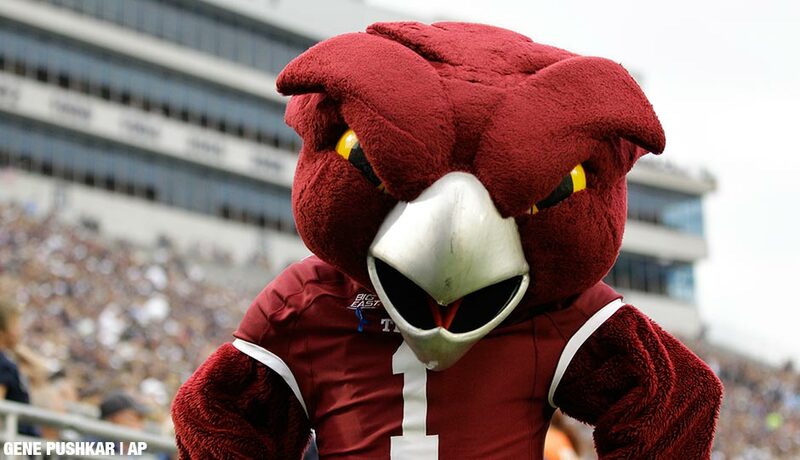 So — what’s in a college mascot’s name? Some are weird, some are whimsical, some are politically incorrect all of a sudden. Just in time for back-to-school, here are the stories behind a few other collegiate sports teams’ names. The Delaware Blue Hen is a type of chicken bred for cockfighting; it’s not an official breed, but is nonetheless the state bird of Delaware. The birds rose to fighting fame in the Revolutionary War, when the fierce First Delaware Regiment was nicknamed “the Blue Hen’s Chickens”; its second company was under the command of Captain John Caldwell, a great fan of cockfighting who often amused himself by staging bouts. 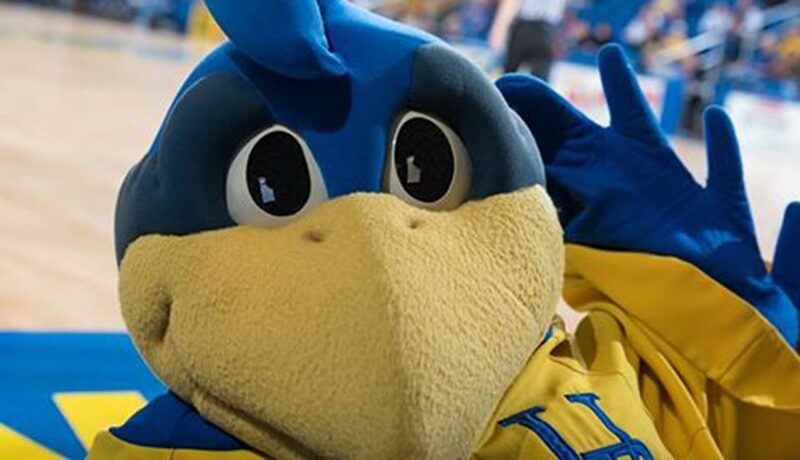 The school’s mascot is known as YoUDee and is modeled on the bird, which really is blue. Nah, Ben Franklin, who founded Penn, wasn’t a Quaker. 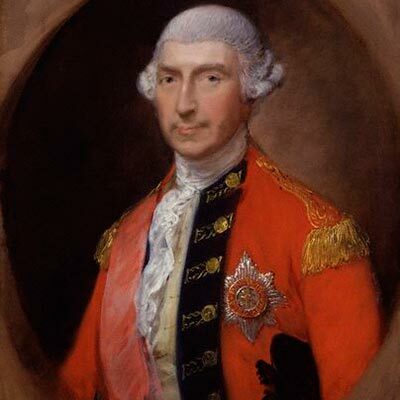 (He was raised Puritan and became a Deist.) And yeah, as a nickname, “Fighting Quakers” doesn’t exactly inspire dread, since the sect is widely known for its pacifism (though a branch did break off during the Revolution because some members wanted to fight). But even though UPenn never had any religious ties with what’s officially known as the Religious Society of Friends, Pennsylvania has long been known as the Quaker State and Philadelphia as the Quaker City; after late-19th-century sportswriters here adopted the sobriquet for Penn’s teams, it stuck. It was a shocker when Witchita State’s men’s basketball team reached the NCAA Final Four in 2013, but that’s not where its teams got the name. The earliest students at what was then Fairmount College supported themselves by “shocking,” or harvesting wheat from nearby fields; the initial football games were played on a stubbled wheat field. 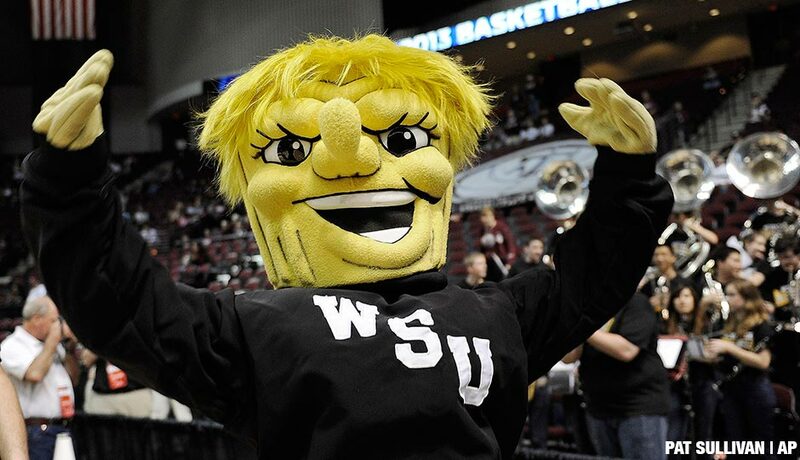 Pep club members were known as Wheaties, and in 1904, a student came up with the name Wheatshockers for the teams. It was officially adopted in 1926. What’s a Hoya? 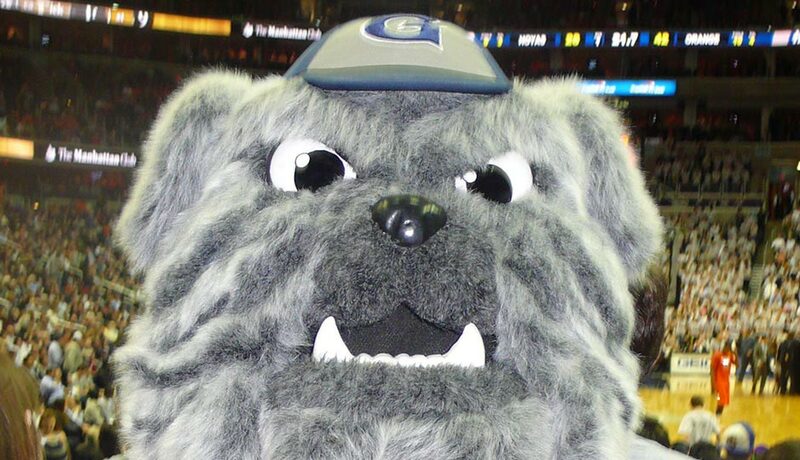 An ancient Greek word (early students here were required to study Greek and Latin) meaning “such” or “what” and incorporated into a cheer, “Hoya Saxa!,” that became popular at Georgetown sporting events in the late 1890s. “Hoya Saxa” means “What rocks!” or “Great rocks!” and may derive from a stone wall around Georgetown’s campus that lent its name to the college’s baseball team, the Stonewallers. “Hoya Saxa!” became the official school cheer and college yell, and newspapers adopted “Hoya” as shorthand for the school’s teams. The student-run snack stand is known as Hoya Snaxa. By Flickr user Billy A via CC BY-SA 2.0. No commonplace Eagles, Bulldogs or Tigers — the three most popular names for American sports teams — for this Midwestern school; its nickname requires a lengthy treatise on 19th-century politics. (Relatively) short version: According to the Homestead Act of 1862, any legal settler in the Oklahoma Territory could claim 160 acres of land by living on and improving it for five years. At noon on April 22, 1889, the territory was opened to aspiring occupants, which resulted in a huge land rush. Certain parties — surveyors, railroad employees, deputy U.S. marshals — were permitted to jump the opening gun; they therefore got there “sooner.” Over time, the nickname came to mean a Progressive who moved ahead of the pack. 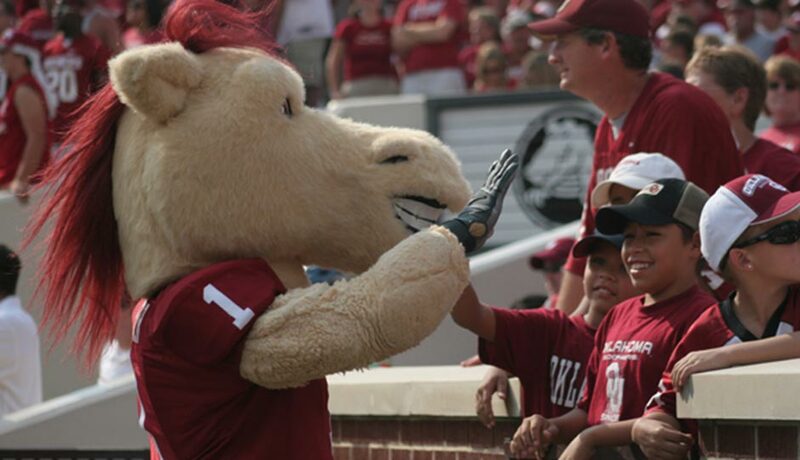 The nickname was adopted in the early 1900s from a University pep club known as the Sooner Rooters. Though SLU is a Catholic, Jesuit university, its mascot, the Billiken, is a mythical good-luck figure, in the same class as a pixie or leprechaun. 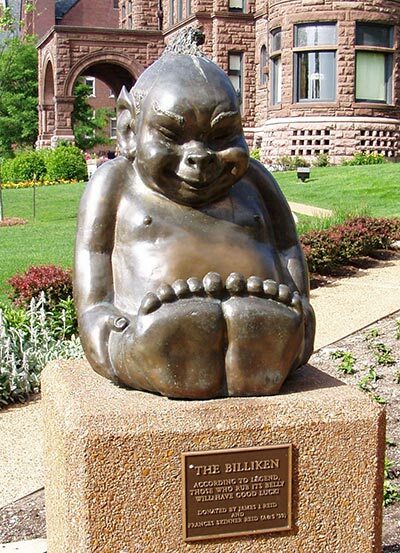 The Billiken, designed and patented in 1908 by Missouri art teacher Florence Pretz, is a smiling, inscrutable naked-cherub-type figure that represents “things as they ought to be,” according to the school. Like the Kewpie Doll of the same era, the Billiken became wildly popular and was featured on such novelty items as salt and pepper shakers, belt buckles and even candy. The story most often offered to explain its association with the university is that an early football coach, John Bender, who took over the team in 1910, looked like a Billiken. And he did, according to a photo offered by the school as evidence. The website of the Indiana Historical Society rejects more theories for the origin of the state’s nickname than it offers, but that’s understandable. The fact is, no one knows where the word “Hoosier” came from or what it originally meant. Among the discredited suggestions: that it derives from a Native American word, hoosa, for corn; that it’s a corruption of “Who’s yer?,” meaning “Who’s here?”; that it’s a shortened form of “Who’s yer relative?”; that it was used for employees of a canal-building company owned by a guy named Hoosier; or that, bloodily but implausibly, it derives from early bar-fight maimings that raised the question: “Whose ear?” You would have to be from Indiana to read the massive body of scholarship that exists about this word, but the plain fact is, “Hoosier’s” origins are lost in the sands of time. So, uh, how exactly does a Nittany Lion differ from a non-Nittany lion? This mascot was invented in 1904 by Penn State senior and baseball-team member Harrison D. “Joe” Mason, who found himself, on a visit to Princeton for a ballgame, embarrassed by Penn State’s mascot-less state. According to legend, Mason made one up on the spot — the Nittany Lion, named for the cougars that once roamed Mount Nittany, a landmark in Happy Valley — and swore it would defeat Princeton’s Bengal Tigers. 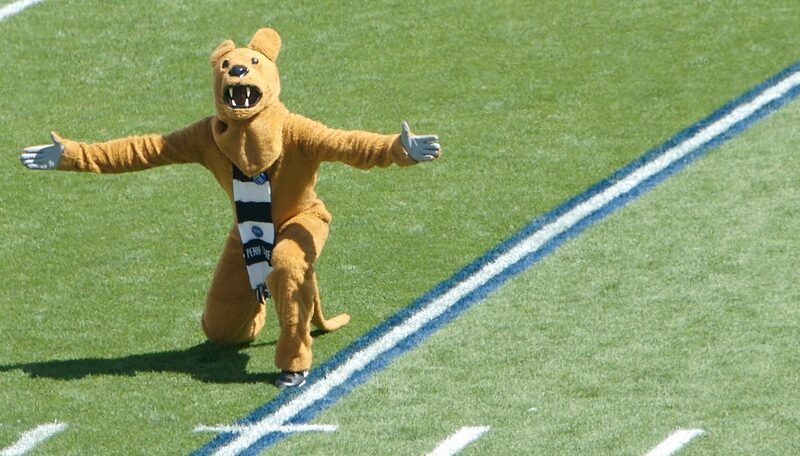 According to Mason, the Lion would do so through the might of its powerful right arm — the root of the one-armed pushups the Lion mascot now does after every touchdown. And where does “Nittany” come from? It’s presumed to be derived from a Native American language and may mean “single mountain” or “mountain lion,” which would make “Nittany Lion” a cool redundancy. P.S. : Mason (and Penn State) won. P.P.S. : There really were Nittany lions. According to National Geographic, one local hunter killed 64 of them between 1820 and 1845 — part of a total of 600 big cats killed in that time span in Centre County. 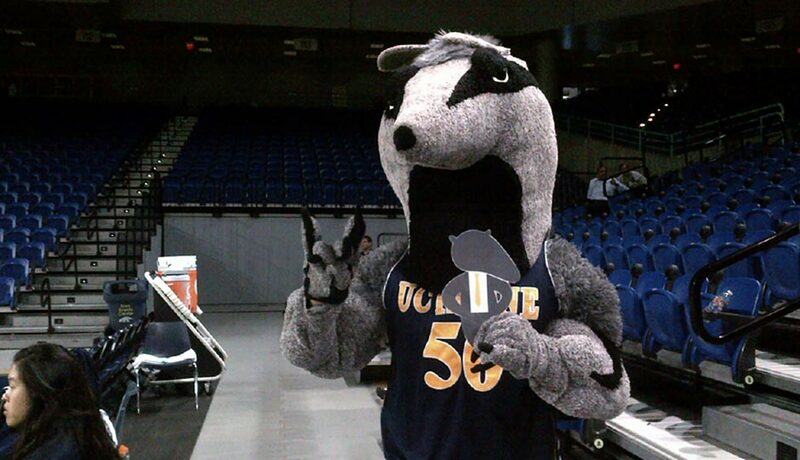 This, uh, unique college mascot was chosen by students in 1965 after two water polo players lobbied for the critter, loosely based on the anteater in the then-popular comic strip B.C. It won 56 percent of student votes, prevailing over such other options as a sea hawk, a bison, a centaur and a roadrunner. Today “Peter the Anteater” and his fierce cry of “Zot!”— borrowed from the comic strip — has inspired campus statues, a campus shop called “Zot-n-Go,” and a pep club known as the Antourage. 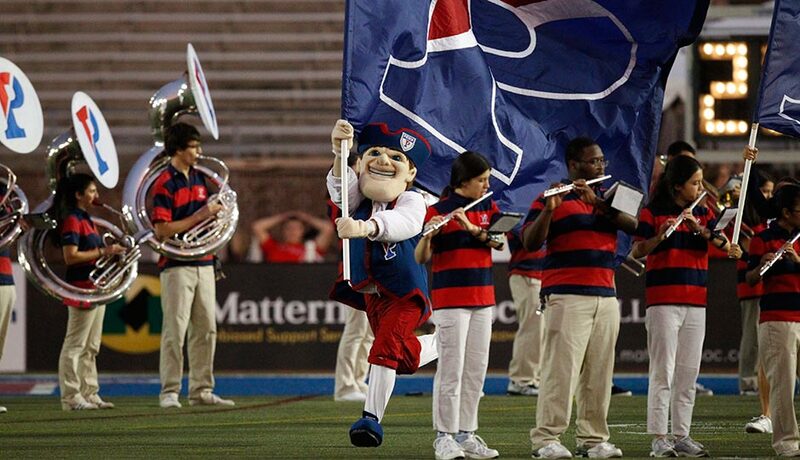 In 2015, Peter proved victorious in a contest for all-time “best college mascot” run by the website Mashable during March Madness.